Today is International Friendship Day and one of the things that I treasure most in my life is my friendships. I'm lucky that my closest friends are also my longest-loved friends having known most of them since my school days. * We have the loveliest group - sometimes known as the cherubs and otherwise known as the mad squad depending on the way the mood takes us and these girls, for they will always be my girls despite the fact that they have grown up into incredible (and I mean incredible women), are everything to me. They helped me learn to ride my bike, sat beside me in school as I learned to spell, stood up for me when someone tried to make me feel small, pushed back for me, made me laugh (and laugh and laugh), taught me to do my make up, danced with me, held my hand when my heart was betrayed and broken, stood at my side as I got married, were the first to visit my children when they were born, taught me how to and encouraged me to fly. I may not see them as often anymore but they know me better than I know myself because they have been there the whole time. 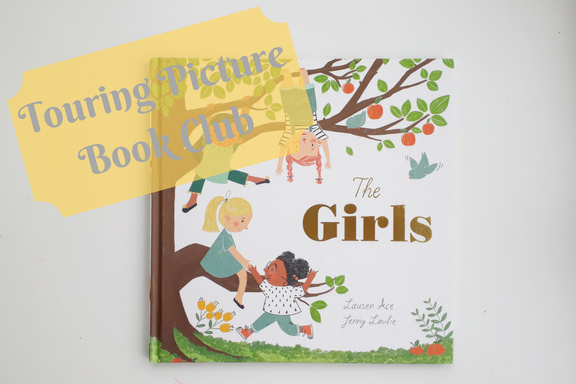 And when I read this new picture book 'The Girls' by Lauren Ace and Jenny Lovelie for the first time, my eyes welled with tears because it really captures my experience of friendship. It tells the beautiful story of four girls who "were are different as they were they same" and how they were best friends. It shows them developing their own personalities, interests, characters but how they also stuck together through thick and thin. How they celebrate each other's successes, and support each other when things go wrong. And as they grow older, this story follows them from childhood to adulthood, they change and grow but their friendship remains steadfast. "Together and apart, the girls went on becoming who they were going to be." The careful wording and thoughtful illustrations in this book are absolutely heart-warming. They show girls, who become women, from different backgrounds, with different interests, with different challenges and successes but who stick together through it all. Because love binds us, holds us together. The illustrations are so touching and they really show the spice and variety of life! I really cannot speak highly enough of this story. And as part of the Touring Picture Book Club (with three wonderful like-minded bookish mum friends) I thought I would look at one way we can help our children to forge friendships to last a lifetime: playdates. So here are my tips for how to organise the perfect playdate! Embrace soft play - it's way better than hosting! So you haven't managed to avoid hosting the playdate at your house: great! Don't bother hoovering the house before anyone arrives as your carpet will be covered in crumbs, Peppa Pig characters and duplo within about two seconds flat! Shut off the doors to any rooms you don't want the kids inside - always your bedroom (and we do the study too because of computer equipment, and bookshelves: I can't be dealing with that stress). Hide any toys that are precious - because inevitably those are the ones that get broken. And remember that your kid might be house-trained, as will you friends kid, but they go all feral when they are together - keep drawing materials strictly supervised! Prepare snacks. Lay out bowls of crisps, and biscuits and obligatory carrot and cucumber sticks and fruit which no one will eat. Apologise that you aren't serving juice (carpet stains!). Make tea and coffee for grown ups and have cake hidden out of kids sight and reach for grown ups! In my experience, the kids just love the novelty of having someone else to play, or someone else's toys to play with but it's always useful to have one or two activities up your sleeve for calming them down or diffusing a fight over a toy. I rely upon Little Brian paint sticks as kids can draw all over the windows with them (which totally makes you seem like the coolest parent ever) and they wash off really easily. Or playdoh. And we have a few little friends who really love to play board games so we keep these and some jigsaws handy too. (Though these take a lot more patience and turn-taking skills so best played before you reach the overtired stage of the playdate). These will happen in broken sentences as you get interrupted every two minutes by an excited child who can't believe their luck that their friend is here. Or a toy needing opened/new batteries/repaired. Or a trip to the toilet. Or to mop up spilled juice. Or to engage with the children. Or to break up a disagreement. Congratulate each other when they leave that you managed to have two and a half conversations that were only interrupted every three minutes instead of every two like last time. They have gone home. Breathe a huge sigh of relief. Look at the chaos around you. Wish you hadn't said "don't worry about tidying up, it will only take five minutes". Reassess - it's going to take 20 minutes. Plonk children in front of TV/iPad and put on whatever keeps them still for more than a minute. Commence tidying up. It really did only take five minutes. Have a cup of tea. And breath another sigh of relief because next time it's someone else's turn! Not sure if he's helping or making more mess. There is no such thing as the perfect playdate. It doesn't exist. The only playdates are the ones that we survive. But, all joking aside, you will cherish watching your child learn to play and make their own friendships. And you will cherish the opportunity to chat with another exhausted parent who feels the same guilt over the littlest things. You need the playdate too. Check out the other activities happening across the Touring Picture Book Club and pop over to Along Came Poppy's Twitter to be in with a chance of winning a copy of this awesome book! And look out for our next touring picture book - "How to Be a Lion" by Ed Vere. And if you've popped over from one of the other fabulous blogs - hello! And our regular readers - hello to you too! Disclaimer: all four bloggers were sent copies of the book after we reached out to the publisher and requested them. Words and opinions are each of our own. *If you are one of my mum-friends I hold you incredibly dearly too despite the fact I've only known you since I had BookBairn three and a half years ago - you know more about me (and my birth stories in the goriest detail) than just about anyone else. Without you I'm not sure I would have survived this parenting malarky! You have a great set of friends and your description of a play date had me 😂. Our house is often worse when it's just my two! Thanks Anna! We always keep the grown up snacks in the middle of my kitchen island where little hands can't reach them!